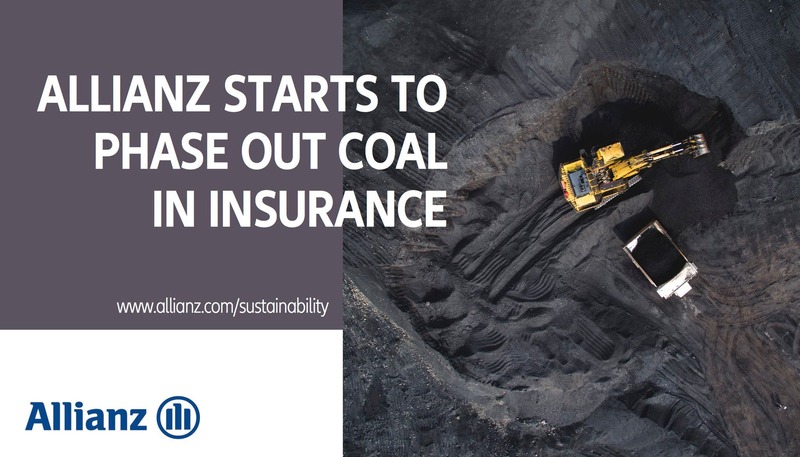 One of the world’s largest insurers, Allianz, has announced it will immediately cease insuring single coal-fired power plants and coal mines and further plans to phase out all coal risks by 2040. In 2017, Allianz was ranked as one of the top three insurers on the Forbes Global 2000 list of the world’s most powerful companies — alongside Ping An Insurance Group and Axa Group — and is ranked as one of the world’s largest asset managers, with third-party assets of €1,448 billion under management at the end of 2017. Spread over more than 70 countries and achieving total revenues of approximately €126.1 billion in 2017, Alliance is a leading financial presence around the world. Thus, when the company makes an internal policy move, the world watches. Towards the end of 2015 Allianz announced that it would stop financing coal-based business models — including companies that derive more than 30% of their revenue from coal mining, or generate over 30% of their energy from coal. Allianz directly linked the decision to the 2°C global warming target of the Paris Climate Agreement and “the economic risks involved” in remaining invested in coal-related businesses. Fast-forward a few years and Allianz revealed on May 4th that it was going a step further in its fight against climate change and coal usage — several steps further, in fact. The company’s criterion have been based on the International Energy Agency’s World Energy Outlook and will allow for very few exceptions — exceptions which will only be approved on a case-by-case basis. Further, Allianz’ Coal Phase-Out Plan will reduce the 30% thresholds by 5% to zero by 2040, with the next adjustment coming within the next five years. Finally, and well in line with the company’s policy decisions, Allianz also announced that it was joining the Science Based Target Initiative. The company’s aims are to work together with partners from science, civil society, and economy within the SBTi to integrate the 2°C target across all of Allianz Group’s relevant business activities. “We will actively inform our clients about the short-term implications and long-term strategic changes. We will work together closely with them to find suitable solutions that enable a joint path towards a low-carbon economy,” said Chris Fischer Hirs, CEO of Allianz Global Corporate and Specialty, the global industrial insurer of the Allianz Group, which will implement the new guidelines as one of many Allianz entities worldwide.